How Colin Mckee Shows the Skills and Abilities of an Enterprising Manager in his Farm Shop and Restaurant. 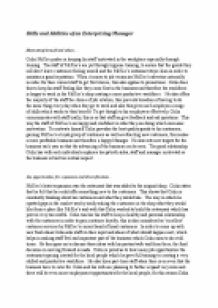 ﻿Skills and Abilities of an Enterprising Manager Motivating himself and others? Colin McKee prides in keeping his staff motivated in the workplace especially through training. The staff of McKee?s are put through hygiene training, to ensure that the goods they sell don?t leave customers feeling unwell and the McKee?s restaurant stays clean in order to maintain a good reputation. When it comes to job vacancies McKee?s advertise internally in order for their current staff to get first choice, this also applies to promotions. Colin does this to keep his staff feeling like they come first in the business and therefore the workforce is happy to work in the McKee?s shop creating a more productive workforce. He also offers the majority of the staff the choice of job rotation, this prevents boredom of having to do the same thing every day when they go to work and also this gives each employee a range of skills which works to their benefit. To get though to his employees effectively, Colin communicates with staff orally, this is so that staff an give feedback and ask questions. This way the staff of McKee?s are happy and confident in what they are doing which increases motivation. 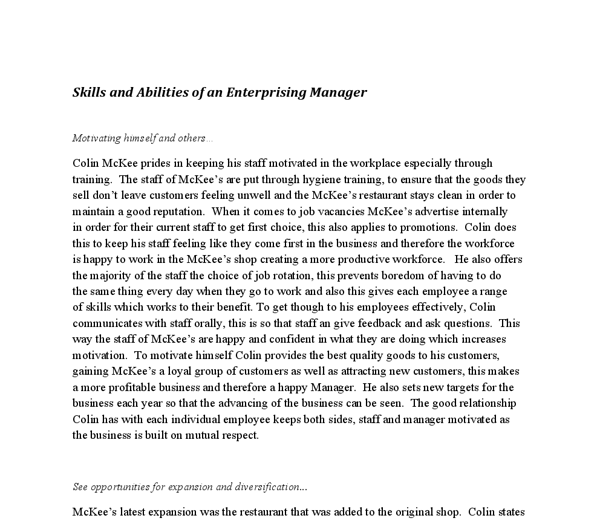 To motivate himself Colin provides the best quality goods to his customers, gaining McKee?s a loyal group of customers as well as attracting new customers, this makes a more profitable business and therefore a happy Manager. He also sets new targets for the business each year so that the advancing of the business can be seen. ...read more. In the process of external recruitment he makes sure to follow employment legislation and always has a statement ready to show as to why he chose a certain person over the rest of the applicants. Colin shows his appreciation to employees by giving them a bonus every Christmas regardless of whether the aims he wanted to achieve had been meet or not, it?s just a gesture of gratitude towards his staff for all the effort they have put in throughout the year and to kick-start them for the year ahead. Having a customer-centred vision... McKee?s is run as a business whose decisions revolve around customers and their needs. In relation to customers Colin likes create a direct and personal relationship with them. He states that ?customers are what make the businesses and gladly welcomes customer feedback in order to improve their services. The way in which market research takes place is that manager, Colin and his staff take the take to have an informal chat to customers when they are in the shop or the restaurant to find ways to improve the business and quality of goods in make them the best it can possibly achieve. This sort of market research is direct, quick and finds out the most relevant customer needs. Colin has stated that customer service and quality is the business? main priority and another informal but vital training he has given to his staff is to smile, this is something most businesses wouldn?t look at as being particularly important because it makes customers feel welcome and wanted, is definitely a big part of effective management. ...read more. Colin has gives each employee to try everything in the business because the more skilled his workforce is, the more profitable and productive the business will be. Colin often takes a lasse-faire and sometimes democratic approach of management toward his employees as they are relatively aware of what they are doing and he trusts them to do it efficiently and effectively. On the other hand Colin has admitted that he becomes autocratic when he needs to be for example when supply is delayed and he has to tell staff on how to handle the matter and make available stock work until the rest arrives. At the beginning of each business year Colin gets his employees involved in teambuilding events where he deals with the issues of communication, problem-solving, decision making and planning. The employees take part in role plays and display what they would do in each of the situations then at the end evaluate their choices. This helps in making sure that employees are all turned on to the same page, it helps motivate, helps staff to get to know each other better which creates a more pleasant working atmosphere, improves productivity within the whole team as one and it?s a practise of effective team working. The way in which Colin sorts out grievances is that he is always open to talk and he takes the time to listen to his whatever problem or issues the employee brings forward and tries his best to work with the employee through it. Colin organises Christmas dinners for his staff and their families round December time, this is to enable staff to bond even more efficiently and also allow the staff to ?feel at home? in McKee?s. ...read more. Also storage and handling Paper is bulky to store in a environment that needs a lot of paper usual they are in boxes or filled into cabinets or just left on the shelf. By using fewer sheets, you can put storage space to more productive use. Therefore, having a set of staff with good personalities could be big advantage. The result for this graph was excellent. 20 out of 30 people said that the food and service are excellent and 10 people said that it was good. of the water and it is visible for everyone such as goals, strategies, products and services and second the informal part of the organization which is under the water and invisible such as values, beliefs, organizational culture and norms. "A psychological contract represents the mutual beliefs, perceptions, and informal obligations between an employer and an employee. 2.6 Inbound tourism The people will be going to the other country for their own reasons such as the business work or the holiday trip and this process is called as the inbound tourism which is also referred as the international tourism.